Nice shot, huh? I’ve got a real eye for photography- the way I was careful to include the parking lot and that car and whatever that kettle thing is on the roof. 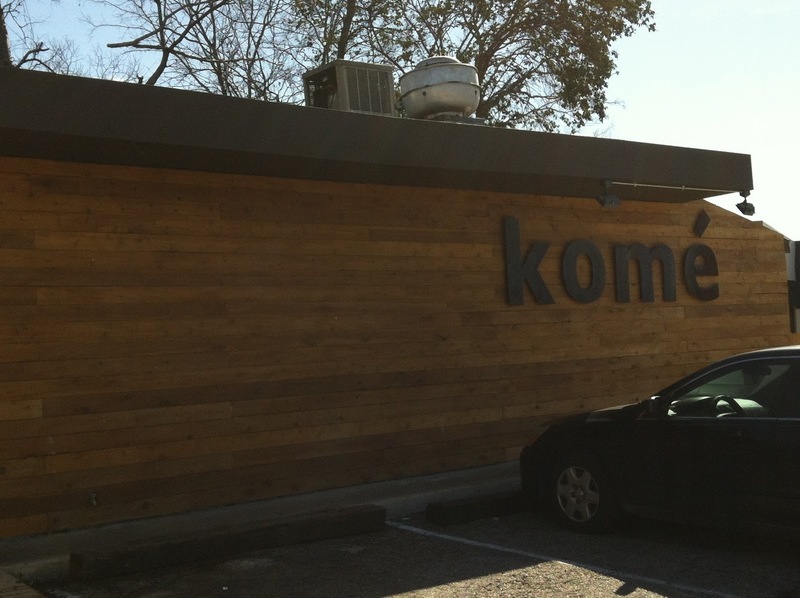 Bad shot aside, komé is a really fun new spot on Airport Boulevard- a place that could use some fun new spots (House Pizzeria aside- that place has still got it!). 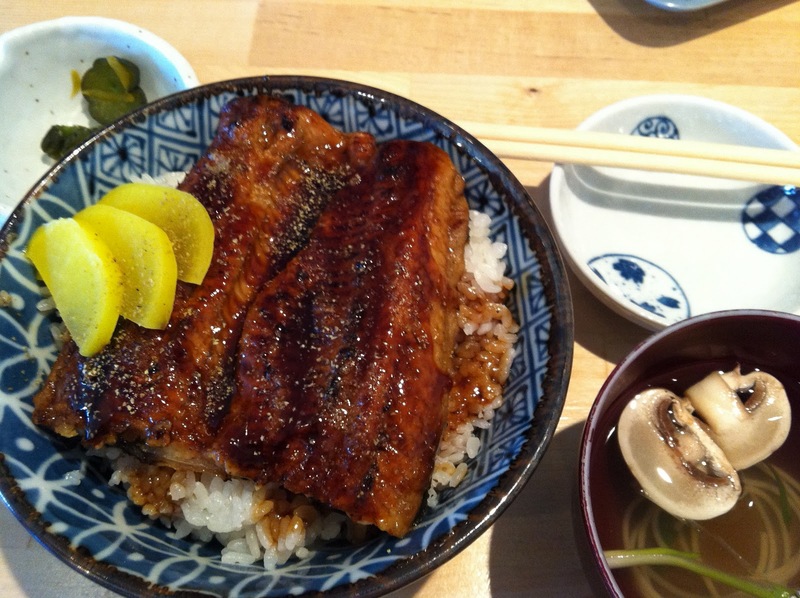 This is the Una-Don bowl- BBQ eel over rice, which came with clear soup and Japanese pickles. I loved it. Really, probably the best eel I’ve had- so buttery and melty, and Henry got to eat some too! The broth was clear and simple- it tasted like miso soup without the miso, which sounds weird, but I think that’s what it was. The pickles were fun too. 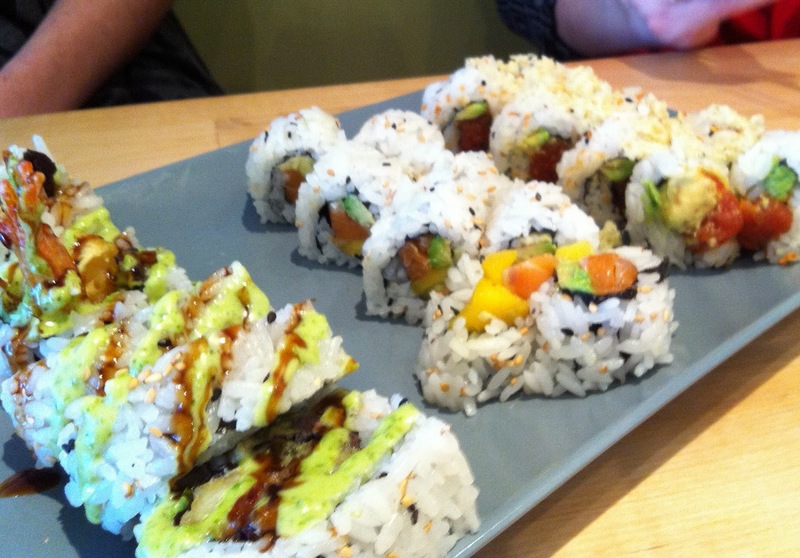 No- this isn’t all my sushi- as much as I’d have liked to eat three rolls in addition to my slab of eel. I picked one simple (read: one of the cheapest on the menu at $6) little roll, the Sunshine Roll, with salmon, mango, and avocado (it’s the roll in the middle of the plate). I ate the whole thing happily, but it wasn’t anywhere near as good as the eel rice bowl. I’m far from a sushi expert, but it seemed like the rice was a little underdone- my friend’s roll (on the right) sort of collapsed into tiny rice heaps when you prodded it lightly with a chopstick. Also, I’m not in the habit of dipping rolls like this in soy sauce because I figure the chefs have already seasoned it the way they think it will taste best. I think they must plan on you using soy though, because the flavors seemed a little flat. Komé- heed M.I.A’s advice and salt and pepper that mango. Anyway, I will return to komé happily, and hopefully soon, to eat more of that delicious eel and to try the ramen! Do give me a shout if you’ve tried the ramen here!